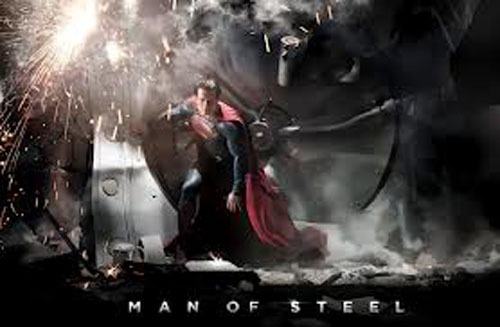 beginning with Zack Snyder’s Man of Steel, Warner Bros. is planning to take a similar approach. We’ve previously written about how Man of Steel could potentially launch DC’s shared movie universe, but few details have emerged as to what that universe will look like and which characters it will include. The only exception was an Easter Egg found in the trailer for the film that suggests time-traveling superhero Booster Gold could be included. According to Zack Snyder himself: “The Wayne Enterprises logo is on a satellite that Zod destroys.” That’s right, Wayne Enterprises (and therefore Bruce Wayne/Batman) is definitely a part of the Man of Steel universe. Of course, that’s not a huge surprise, since Batman will be an essential part of any future Justice League movie. However, this is the first time we’ve gotten actual confirmation that something Batman-related will be featured in the movie. Now we get to speculate when Batman and Superman will actually meet. It’s unlikely that there will be a cameo of Bruce Wayne/Batman in Man of Steel, but it’s easy to imagine how the plot of Man of Steel could set up a meeting between the characters. It’s actually similar in some ways to The Avengers. When Zod and his army invade earth, it might wake up Wayne to the reality that there are much larger threats to the world than just his enemies (in much the same way that the existence of Asgard was a wake-up call to S.H.I.E.L.D.). As the World’s Greatest Detective, Batman will undoubtedly want to find the person causing all of the drama: Superman. Would Lex Luthor be a good villain for Superman and Batman to take on, or would it have to be some bigger threat to be important enough for the World’s Finest?